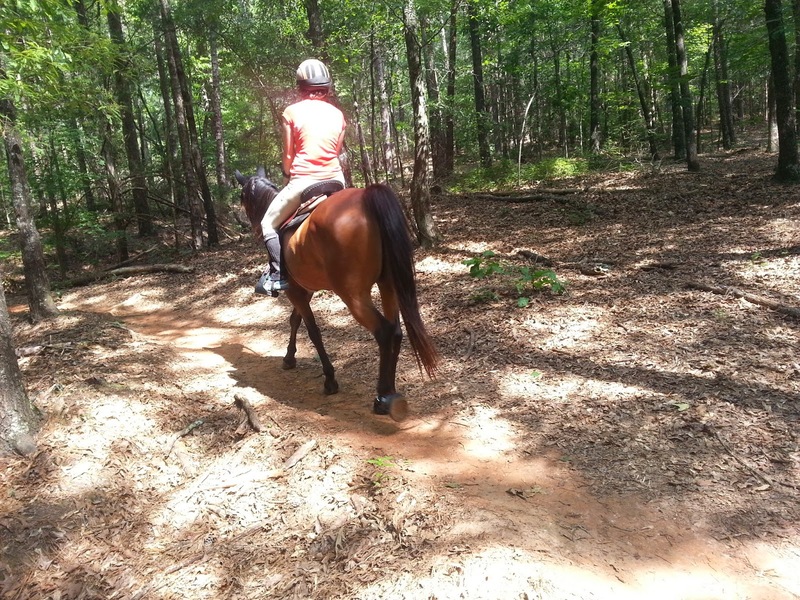 The Many Adventures of Gem and Sara: endurance riding, hunter pace, equathon, ride and tie and anything else we can think of. Ok...I'm going to assume you either read the details on the boots or don't care, so this will focus mostly on the trial. 2) Stickability: would they stay on? 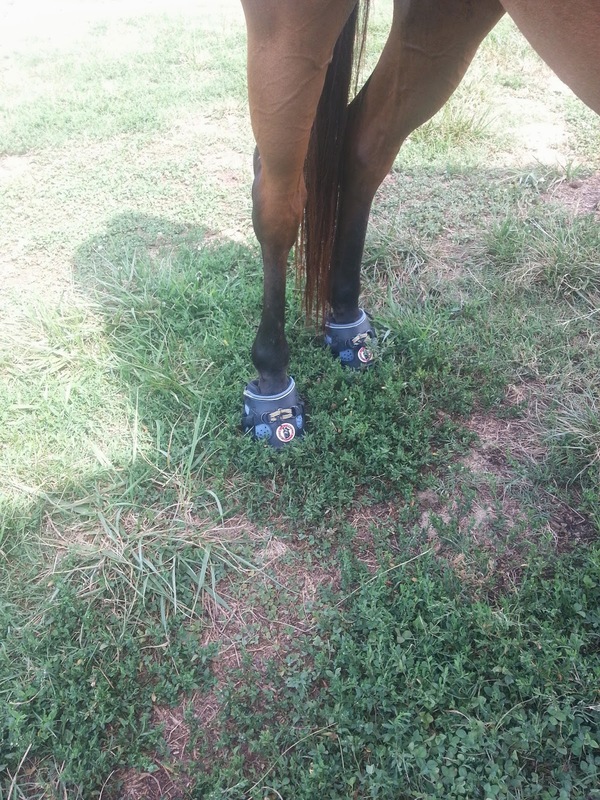 Sunday morning I headed out to the barn with the intention of trying them on her and if they fit well enough going to Clemson to try them out. 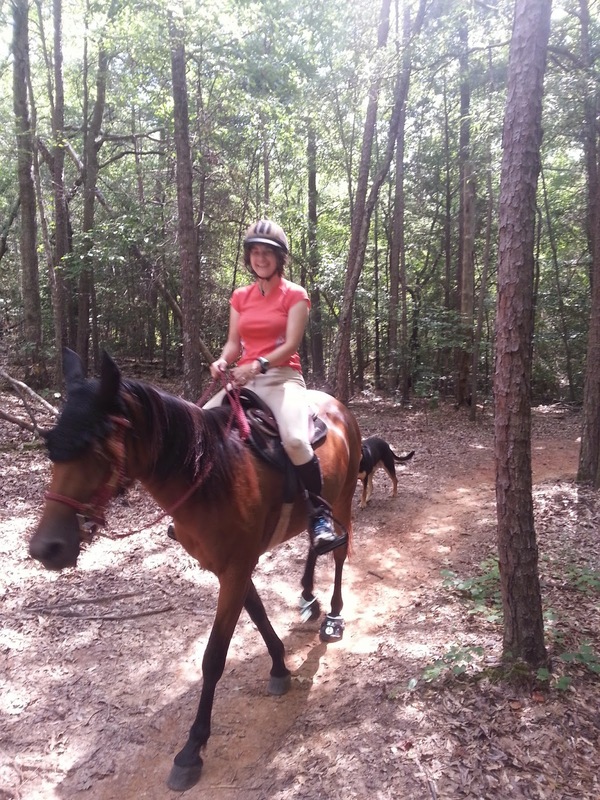 I had permission to ride on two separate one hour long trail rides to check form and function. I wanted it to be on familiar territory to rule out her tripping or being weird because of the new location versus the new boots. I cleaned her feet super well and then reached for her front left. I opened the boot all the way up and slid her foot into it, but it was pretty tight. I tried to close it up, but I couldn't get the Velcro sides even half way together and when I tried to snug it up it just wouldn't budge. So I left it in place and moved to the right front, but had a similar situation. Hmmm...perhaps if I walk her around they will settle in place? So I did and they didn't. I took them back off and looked inside at her foot print. It was off the back of the boot. Hmmm.. 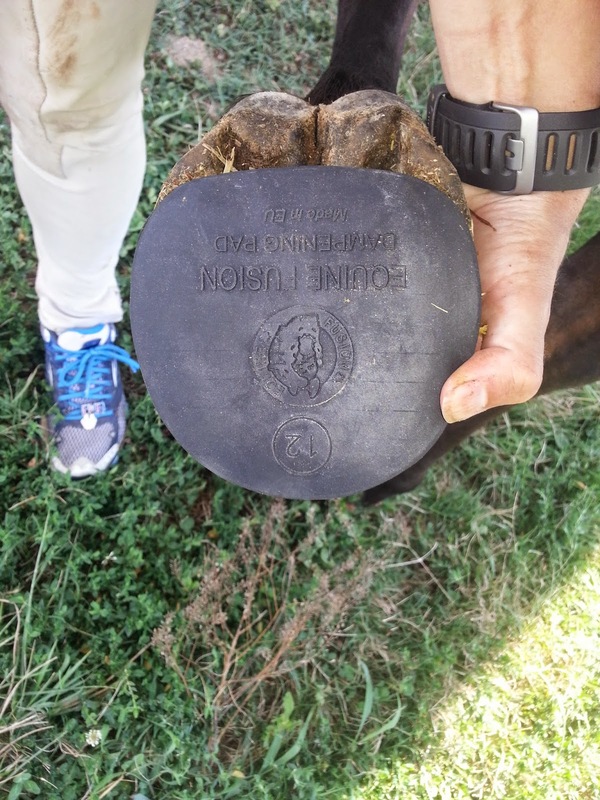 I then took the dampening pad out and held it against her sole and low and behold the monster, massive boot was too small!! When aligned with the toe, her entire heel is off the back. Way too small. I have no clue what I was smoking when I measured her, but apparently I measured an entire size too small. No wonder they wouldn't go on and tighten up. Darn. I moved to her rear and held up the pad to check the fit. Going in I was worried about the width being too much for her narrow hoof, so I paid extra close attention to this. 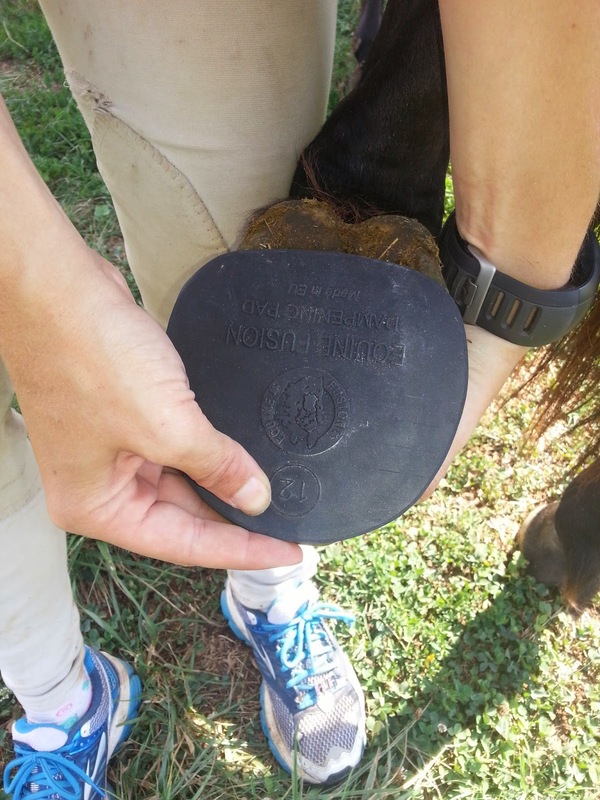 There is about a 1/4" overhang of pad on each hoof, but that didn't seem too bad to me. Back left. A much better fit. Knowing these would at least go on, I loaded her up and made our way to the trail head. 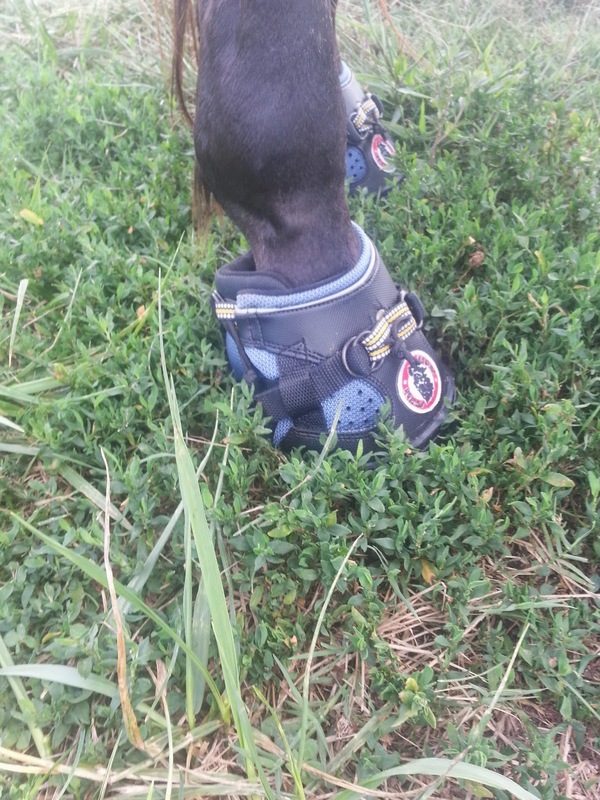 The hubby met us there to hike and I started the process of getting her hind boots on. I wanted a boot that wouldn't require either a mallet or messing with a ton of cables to get on and these definitely fit that bill. 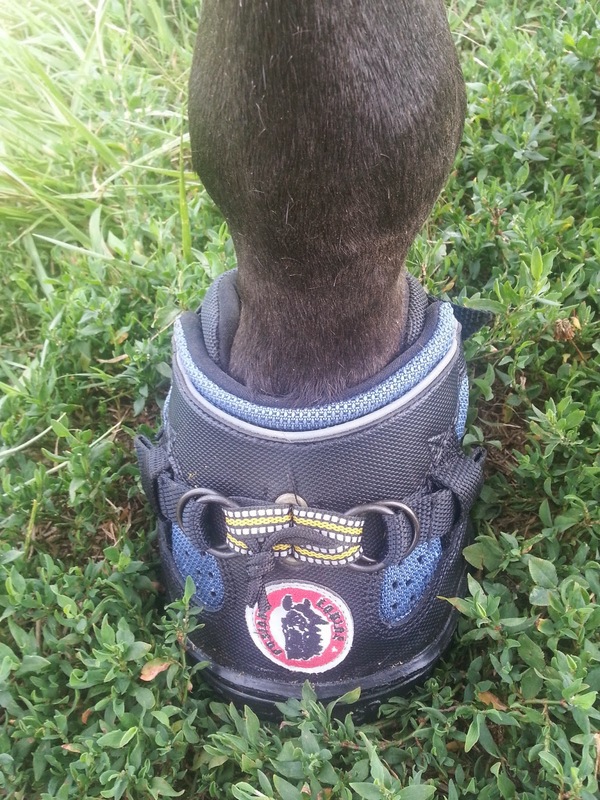 Even being the first time I tried, I was able to easily slip her hoof into the boot. It opens up very wide and is simple to do. I pulled upward on it to make sure the toe was well seated and then let her put the hoof down on the ground. 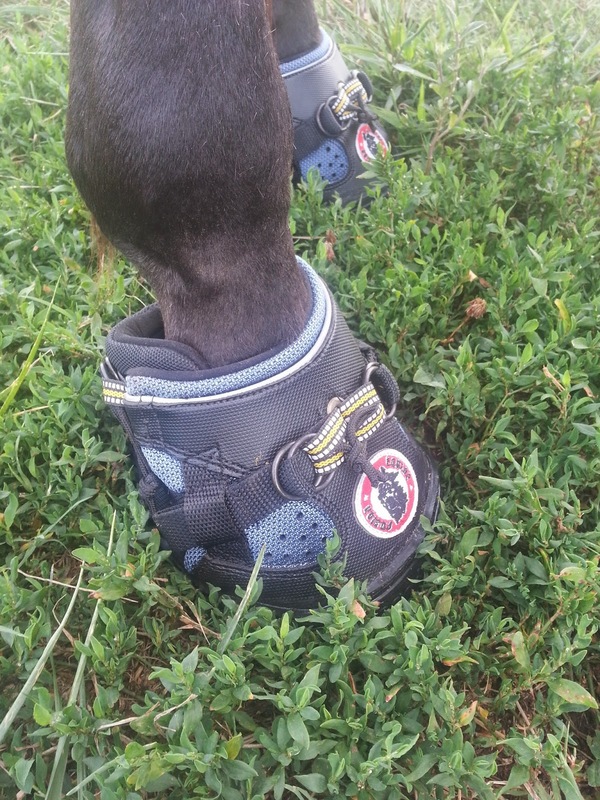 Once there I fiddled with the back strap, pulling that as tight as I could and then went to the front. All in all is took me maybe 5 minutes to get them on. I figure after a while it will only take 2-3 minutes. It was that easy! Everything seemed to fit nice and snug except there was a fingers width gap in the back. I'm not sure if this is and issue or not. I have tried to email the owner about it and even posted the picture and question to their facebook page without a response. 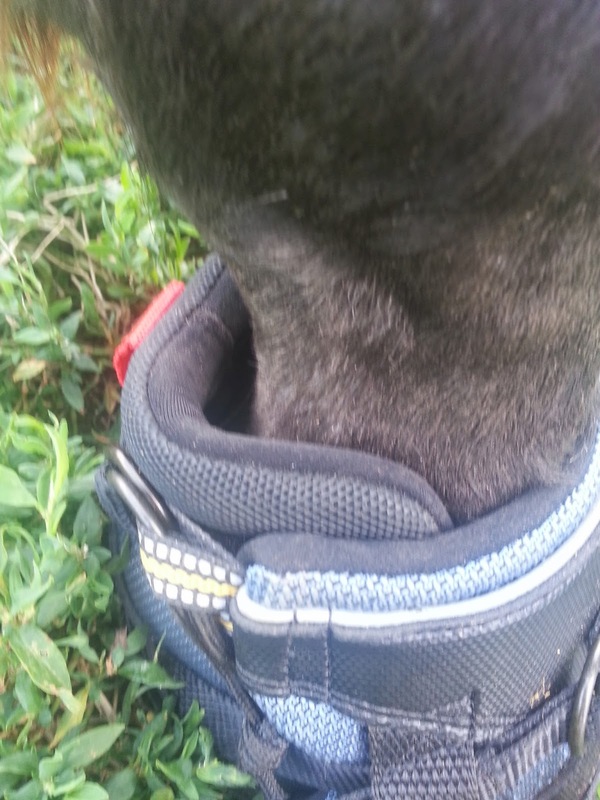 I made a mental note to check this area well afterward for rubbing, but the more I thought about the function of the hoof and lower leg, the leg must rock back to push off so maybe a little room to move isn't so bad. Time will tell on that. I hand walked her to the trail head to see how she moved and look for any obvious looseness or issues. She took some very high, odd steps but quickly got used to them. They are super light weight so I wasn't too concerned about them. Once on the trail I decided to go out 30 minutes and turn around. I know she hates out and back rides, but I didn't want to go over the limit and I had no where to hold them if I wanted to go out longer and just take them off. This also gave me some ability to perhaps find one on the way back if it came off on the way out. During the ride I tried to maintain as much trotting as possible. Unfortunately, without the fronts being on I couldn't push it too much on gravel. We did cross two creeks, go through deep sticky mud, slick mud over some trees and down the gravel access road. She moved out just fine and was forward and happy the whole time. Now this probably isn't due to having boots in the back, but at least they were not causing any issues. Unfortunately, what I didn't do is take after shots, but that was because there was nothing to see. No rubs, no twists, no nothing. They stayed right on through it all and came off in 30 seconds. The sole showed no signs of wear even after all the gravel work and her feet looked perfect. I was very, very pleased with them. I need to return the fronts and get the next size up and then I can try all 4 to see how she does. If the fronts fit as well as the back, then we are in business! I know they are a completely different concept and not everyone will like them, but I can really stand behind the logic of the boot and Gem rode great in them. END PLACING: 6th out of 290!! My first freakin’ 100 mile run FINISH!!! What Should A Newbie Know?